After the grand launch of Bigg Boss season 12 , Salman Khan has introduced the show's first entrant. Among many, it's Bharti Singh and Haarsh Limbachiyaa who have confirmed their entry in the show. This time the show is entirely based on a different theme i.e. vichitra jodi. Check out the whole deatils. Bollywood actor Salman Khan has once again come back with a bang with Bigg Boss season 12. With a lot of spice and gossips, the show makers have promised to get a fresh and entertaining scoop of episodes for the viewers. While fans are waiting for the new season with bated breath, Salman Khan has revealed the first jodi of the season during the grand launch of the show. Any guesses? 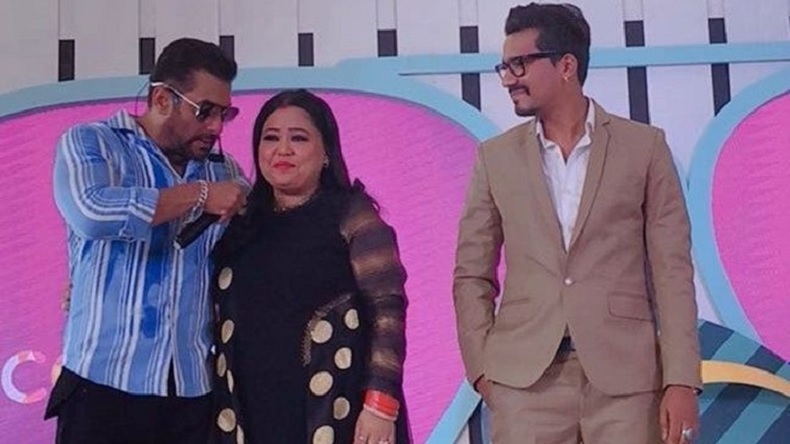 They are none other than Bharti Singh and Haarsh Limbachiyaa. Confirming their entry in the season 12, Bharti said they would enter the show. Since Harsh had a lot of work so if he got eliminated, she would want to win the show. On being asked the reason behind for signing the show, the couple said they signed it for money. Further jokingly Bharti mentioned that ever since she got married, Colors had taken care of the bills. Giving a theme as vichitra jodis this year, as per reports, there will be 21 contestants consisted of celebrities and commoners. Celebrities who are in pairs will enter as individuals. Further elaborating on the same, reports have suggested five commoner pairs, five solo commoners and six solo celebs will participate. Salman Khan will pair the single contestants on the day of Bigg Boss 12 premiere. On hosting the show, Salman Khan quoted earlier people used to ask him when he was getting married. Now people ask if he was hosting Bigg Boss. He thought he would marry Bigg Boss. In the past, the show was launched in Lonavala and the contestants directly entered the house. Bigg Boss 12 will begin on September 16 and will telecast for the next three months from Monday to Friday at 10.30 in the night, and Saturday to Sunday at 9 in the night on Colors TV.